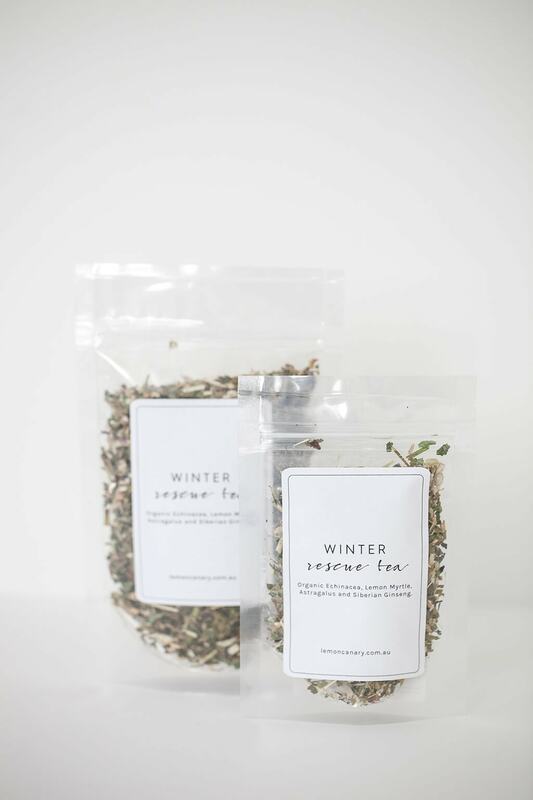 Organic Winter Rescue Tea – A warming and healing winter tea. Echinacea – Boosts the immune system and can lessen chances of catching a cold. Known to alleviate pain. Anti-inflammatory. Can assist with relieving upper respiratory symptoms. Fights infection. Lemon Myrtle – High in zinc, calcium and magnesium, vitamin A & E. Anti-viral properties. Known to destroy disease carrying micro-organisms. Astragalus – Immune boosting. Contains Saponins known for their ability to prevent cancer and boost immunity. Contains Flavonoids that scavenge free radicals, known to help prevent cancer, heart disease and immune disease. Contains Polysaccharides known to be anti viral and anti fungal. Siberian Ginseng – Supports the immune system. Can help to prevent cold and flu symptoms. Known to relieve stress related illness. Preventative for respiratory tract, cold & flu infections. Helps to restore vigour and general health.